Much like its titular magazine, The Travelers is a whirlwind journey that takes readers to some of the world’s most desirable places. For starters – America, France, Argentina, England and Iceland. But for all of the glamour, fine wine and food, these places just provide the backdrop on an engaging, twisted and compulsive thriller. Will Rhodes is a writer for Travelers magazine. His job is to fly around the world to places that his readers would like to go, take photos, eat good food, drink expensive wines and attend A-list parties. This not only keeps the readers and advertisers happy but supports Travelers’ side business as an exclusive travel bureau to the rich. But right from the cold open, Will is in trouble and the first part of the story just highlights how deep that trouble is. Soon he finds himself lying to his wife and his colleagues and becoming involved in clandestine operations which seek to use his real work as cover for espionage. Will is a likeable hero – he is no James Bond but is just resourceful enough to feel like a real person trying to work his way out of trouble. Chris Pavone puts a lot of balls in the air in The Travelers. Will is not the only one with secrets. Everyone is hiding something – his editor, his co-workers, his wife and his new “employer”. The interesting aspect of The Travelers is the way that this deception plays out into their personal lives. Pavone is interested in partnership, particularly marriage, and the impact of work and secrets not only on Will and his wife but the other staff of Travelers magazine. While the issues are heightened by espionage, there are nevertheless real and provide The Travelers with a solid emotional core. There is also plenty of social commentary. Pavone has a sharp eye for the foibles of modern society, never more on display than when it involves international tourism. While the book roves around the world and he has something to say about the travelling class, most of Pavone’s wit is saved for his home town of New York. But while his characters are recognisably American, there is plenty of sly and overt comment here that translates well across the first world. 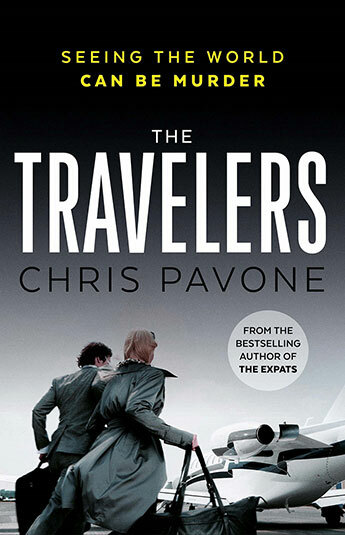 But aside from all of this, The Travelers is first and foremost a thriller. And it’s a thriller that works. Pavone succeeds in setting up layers of secrets. The more he unravels, the more the pressure on Will mounts. While The Travelers has a premise that requires more than a fair amount of suspension of disbelief, it eschews the common moustache-twirling terrorism tropes that pervade much of the genre. And given this premise, Pavone also leaves enough of his balls in the air so that when the action finally settles down to set up for a potentially very different sequel.